The estate of J.R.R. Tolkien believes Warner's LotR slot machines are highly offensive. 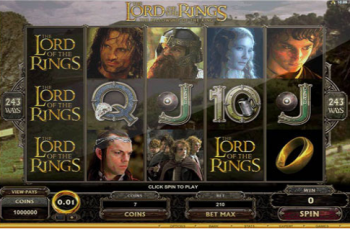 The Tolkien estate and publisher HarperCollins are going after Warner Brothers and its New Line subsidiary, claiming that the slot machines Warner intends to produce based on The Lord of the Rings are well outside the agreement originally reached in 1969. "The original contracting parties thus contemplated a limited grant of the right to sell consumer products," the complaint claims, "of the type regularly merchandised at the time, such as figurines, tableware, stationery items, clothing and the like. They did not include any grant of exploitations such as electronic or digital rights, rights in media yet to be devised or other intangibles such as rights in services." "Particularly in the aftermath of the unprecedented financial and critical success of the Films," the complaint continues, "defendants have, with increasing boldness, engaged in a continued and escalating pattern of usurping rights to which they are not entitled." The full complaint can be found here, courtesy of the Hollywood Reporter. The complainants are seeking an injunction against the slots and anything else that goes beyond the original agreement, and a cool $80 million in damages. The complaint specifically mentions videogames and other "intangible" merchandise, but it's the slot machines - both virtual and real world - that really have them up in arms. The Tolkien estate in particular finds the slots highly offensive, and the complaint claims the slots have done irreparable harm to the goodwill the books have generated over the years. That said, the Third Claim for Relief also targets any and all digital, download-only videogames associated with The Lord of the Rings or The Hobbit. The Plaintiffs seek permanent injunctive relief; in other words, those games have got to go.